It’s a small gesture, but a helpful one. At General Mitchell International Airport in Milwaukee there’s a “recombobulation” area for passengers to gather their wits after the stress of passing through security. Don’t bother looking up “recombobulation.” It’s not a word. But “discombobulation” is, and it’s also how many feel after standing in long lines, posing in scanners and holding their pants up after removing their belts. The word was invented by Barry Bateman, former airport director at MKE. 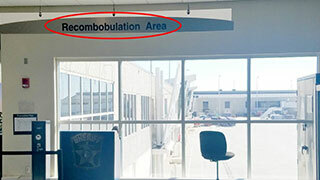 Per Bateman’s suggestion, a sign for a “Recombobulation Area” was hung up after the security checkpoint in one of the terminals in 2008. The goal was to add a bit of humor to the stressful security process. “He understood that travelling can be stressful and the signs are intended to put a smile on people’s faces,” Harold Mester, the airport’s public relations manager, told OnMilwaukee. But for a made-up word, it serves a much-needed purpose. Every terminal in Mitchell International now includes a designated “Recombobulation Area,” complete with benches and chairs for passengers to put on their shoes and belts and gather their belongings. Despite the word not being among those recently added to the dictionary, the signs have been fully accepted by the TSA due to their overwhelmingly positive response. Even grammar enthusiasts approve. In 2009, “recombobulation” was named the American Dialect Society’s most creative word of the year. So far, no other airports have followed suit with their own recombobulation areas, but here at Open Jaw we think they should. In fact, we have recently installed a recombobulation area at OJ HQ. It’s a great place to recover after a conversation with Ivanna Gabbalot.